The AA says petrol prices have recorded their biggest fall since 2008, taking the average cost to 132.16p a litre. 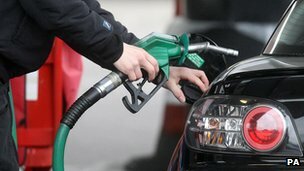 The motorists' lobby group said average petrol prices fell 5.49p a litre between mid-September and mid-October, the biggest monthly fall since prices fell 11.5p in November 2008. The price of diesel has fallen from 142.50p a litre to 139.12p. The AA said lower wholesale fuel prices had prompted the price drop, but warned that further falls were unlikely. The organisation says the recent drop in prices means the cost of filling up the tank of a small petrol car has fallen by £2.74, while a larger vehicle, such as a Ford Mondeo, would cost £3.84 less to refuel. Northern Ireland is the most expensive place for petrol, with an average pump price of £132.9p a litre, and London, the north of England, and Yorkshire and Humberside are the joint cheapest at 131.9p. Scotland is still the most expensive for diesel at 140.1p a litre, while London is the cheapest at 138.6p. Why are gas prices going up while petrol prices are going down? The cost of filling up the car has fallen slightly, but the gas price bubble just seems to grow bigger and bigger. One explanation is that petrol prices are affected by movements in the dollar/pound exchange rate, because crude oil and refined petrol are both priced in dollars. The pound has enjoyed a significant recovery against the dollar in recent months, jumping from about $1.50 in value to around $1.60. So while crude oil hasn't moved much in world markets, the cost to us in the UK has gone down. Gas, on the other hand, is traded in sterling in the UK. There is less of the currency effect. Not everyone in the energy market believes a price increase is justified. But British Gas says the cost of getting hold of gas and electricity accounts for a third of the jump in bills. Will the petrol drop compensate for the gas hike? If you fill up the car once a week, you are likely to gain more than you lose. However, occasional drivers will still have cause to shiver from this week's energy news. The petrol benefit will be outweighed by the cost of keeping warm. Regional variations depend on whether an area is mainly urban - in which case there is more competition - or if it is mainly rural - in which case suppliers have higher transport costs and there is less competition. Overall, the AA says the UK has the seventh-highest petrol price and the second-highest diesel price in Europe. The fuel price data is supplied by the research firm Experian Catalist. Higher prices The AA said further falls in petrol prices were unlikely, because of poor refinery capacity in the UK and the likely strengthening of the US dollar. The US dollar is expected to rise in value now that the standoff over the country's budget is over and oil is priced in dollars. The AA's president, Edmund King, said: "A more than £2.50-a-tank cut in petrol costs for families is a dramatic improvement on its own. But, heading into winter with cars using more fuel, the timing couldn't be better. "Alongside Asda, Sainsbury's decision to fully reflect the fall in wholesale prices has been a huge benefit for drivers and businesses. "However, the AA is also encouraged by the growing band of non-supermarket retailers challenging the pricing of other supermarkets whose prices in many places are far less generous," he added. The organisation said that the situation at the Grangemouth refinery in Scotland, where a dispute between management and unions has led to a temporary closure, had highlighted the UK's lack of refinery capacity. It urged the government to find ways to support domestic refineries. I am really happy for you. This post shows how much benefits for marketing. Lowest Price Traffic School California online Traffic School for traffic tickets, Traffic school course for ticket dismissal & – DMV/State & DMV-Licence court approved course in CA.